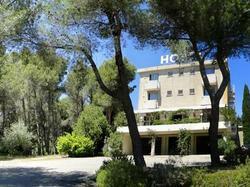 Set in a pine forest, this hotel is located at the foot of the Ardeche River Gorge. It features an outdoor pool and a shaded terrace offering views of Mount Ventoux. The air-conditioned rooms offer views over the garden and swimming pool. Some rooms feature a private balcony. Each room is equipped with a flat-screen TV with satellite channels and free internet access. The private bathrooms feature a bathtub. Hôtel Le Valaurie features a restaurant serving traditional Provencal dishes. A buffet breakfast is served every morning, and can be taken on the terrace. With free private parking, Le Valaurie is 30 km from the town of Orange. Guests can go canoeing and kayaking in the River Ardeche. This air-conditioned room features a satellite TV with satellite channels and a private bathroom.